Net income was $16.9 million, or 10 cents a share, for the three months through April, compared with a loss of $20.8 million, or 12 cents a share, a year earlier, the company said Wednesday. The average estimate of 18 analysts in a Bloomberg survey was for a profit of 3 cents a share. The housing market in the United States is stabilizing as rising employment and record-low mortgage rates lure buyers. Toll Brothers, based in Horsham, Pa., benefits from increased demand for move-up homes and a wealthier customer base with access to cash and credit. The company said quarterly orders surged 47 percent from a year earlier in a robust spring selling season. Purchases of new homes in April increased 3.3 percent from the previous month to an annual pace of 343,000, the Commerce Department said. The rate was 316,000 a year earlier. The improving real estate market is enabling buyers to sell starter houses and move up to larger properties, including those offered by Toll. Sales of previously owned homes rose 3.4 percent in April to a 4.62 million annual rate, the first increase in three months, theNational Association of Realtors said on Tuesday in Washington. 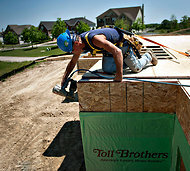 Toll’s home-building revenue for the quarter increased 17 percent from a year earlier to $373.7 million. Closings rose 14 percent to 671 homes. Orders climbed to 1,290 homes from 879 a year earlier. The company’s backlog, an indication of future sales, rose 37 percent to 2,403 homes. By value, the backlog jumped 49 percent to $1.5 billion. The average price of a Toll Brothers home under contract was $585,000 in the second quarter. The company said the average price of closings in the next two quarters would be $560,000 to $580,000. The company expects to deliver 2,700 to 3,200 homes in the 2012 fiscal year, with closings in the fourth quarter about 10 percent higher than in the third. Toll rose 2.7 percent to $27.75 Wednesday on the New York Stock Exchange. The shares have gained 36 percent this year, matching the advance in the 11-member Standard & Poor’s 1500 Homebuilding index. A version of this article appeared in print on May 24, 2012, on page B4 of the New York edition with the headline: Toll Brothers, Orders Up, Beats Profit Expectations.